Russian President Vladimir Putin spent much of his state-of-the-nation speech on Thursday talking about nuclear weapons. With a clear message to the United States, he especially highlighted new missiles that would be immune to possible missile defence shields. “Nobody has anything like this,” Putin said simultaneously as a video animation was displayed on big screens, showing how both Russia’s new ballistic- and cruise missiles can’t be intercepted. Putin’s nuclear war-drumming were applauded by the audience in Moscow consisting of the country’s lawmakers, ministers, high-ranking officials and key business bosses. Around the world, the President’s speech got massive media attention. What got much less attention, was a small sentence in a larger interview with Russia’s Deputy Prime Minister Dmitry Rogozin published by newspaper Kommersant this week. Rogozin, who was Russia’s ambassador to NATO in Brussels until December 2011, talks in the interview about his first days at work as Deputy Prime Minister in charge of defence industry. “Ekaterinburg” was at the time one of the Northern Fleet’s six ballistic missile submarines and a core part of the naval leg in Russia’s nuclear triad. The submarine, also known as K-84, is a Delta-IV class that normally carries 16 ballistic missiles, each armed with four nuclear warheads. That means up to 64 nuclear bombs in the missile tubes at the time when the fire started on December 29. Additionally, the submarine is powered by two nuclear reactors. The reactors were shut down when the K-84 was taken into the dock on December 8, and when the fire made headlines across Russia and international media, Defence Ministry officials assured the world that also the missiles had been removed. What Rogozin now says in the interview with Kommersant confirms what many for years have believed; the removal of the nuclear-armed missiles was simply not true. Not removing the nuclear missiles or other weapons is a violation of the navy’s safety regulations and practice when submarines are taken into a dock for repair. After about 20 hours, the fire on the rubber coating of the submarine was put out simply by lowering the dock and let seawater in. What worst-case scenario could have been if the torpedo fuel or ballistic missile fuel had caught fire is hard to imagine. The R29RM missiles used liquid fuel and in a worst case scenario with burning fuel, the missiles could have exploded and fragmented the plutonium warheads and spread radioactivity to the surrounding area. Additionally, parts of the plutonium could have been taken up in the atmosphere by the smoke from the fire and brought over longer distances by the wind. In the aftermath of the fire, both Norway’s Foreign Minister Jonas Gahr Støre and Sweden’s Foreign Minister Carl Bildt said they were critical to the lack of official information from Moscow. The question about possible nuclear weapons on board K-84 started to spread when the fire became known in the Murmansk area. Roslyakovo is a settlement with a few thousand inhabitants located six kilometres north of Murmansk and seven kilometres southwest of the Northern Fleet’s main base Severomorsk. More than 400,000 people were living within a radius of about 30 kilometres from the submarine on fire. 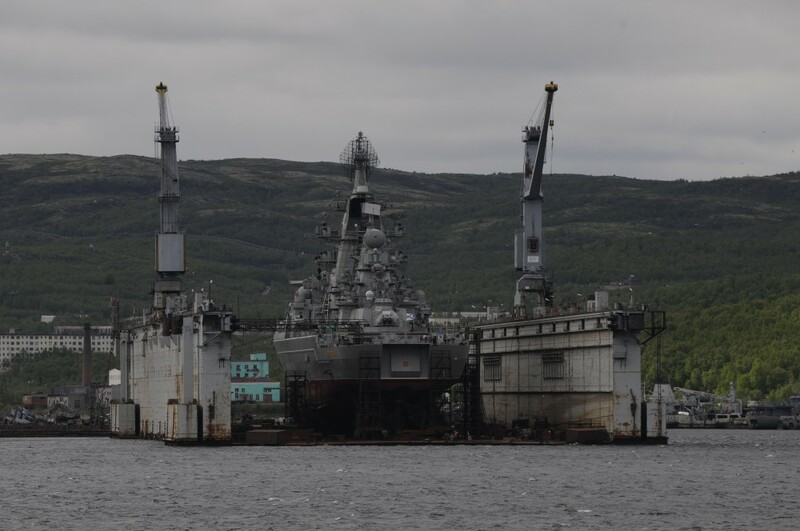 That includes the two cities of Murmansk and Kola, and the five closed military towns of Severomorsk, Snezhnogorsk, Polyarny, Gadzhiyevo and Vidyaevo. The Norwegian town of Kirkenes is 145 kilometres away while Finland’s northernmost town of Ivalo is 230 kilometres from Roslyakovo. Serious accidents involving nuclear weapons, including fires, are infrequent but have happened before. The best known was back in 1968 when an American B-52 carrying four hydrogen bombs crashed at Thule Air Base on Greenland. Radioactive plutonium was then spread over a larger area. In 1991, an are intest-missile exploded in the silo on board a Typhoon submarine loaded with 19 nuke-missiles and caught fire in the White Sea. Two years before, the Northern Fleet’s submarine “Komsomolets” caught fire in the Norwegian Sea and sank with two nuclear torpedoes on board. “Komsomolets” and her two warheads are still on the seabed some 160 kilometres southwest of the Bear Island.